All are invited to CASA Kane County’s 13th Annual Hands Around the Courthouse to help bring awareness to child abuse and neglect. The event begins at noon on Thursday, April 7, in the lobby of the historic courthouse on Third Street in Geneva. The 15-minute ceremony will feature the swearing in of new CASA/GAL advocates by Judge William Parkhurst. Other speakers will include Chief Judge Susan Clancy Boles, States Attorney Joe McMahon and CASA Executive Director Gloria Bunce. Lunch to follow. Volunteers will be needed following the event to help remove 600 symbolic pinwheels from the courthouse lawn. Susan Clancy Boles, chief judge of the 16th Circuit Court, gave the club some insights on what it is like to be a judge in Kane County. Starting out as a civil lawyer in Chicago, Clancy Boles’ career has taken her through associate and circuit court judgeships to the chief judge’s post, where she oversees the courtrooms of 32 other judges. 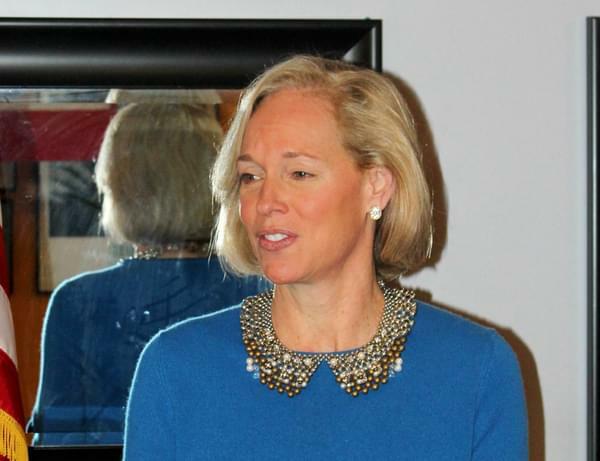 In her remarks last month, she was highly complementary of the Kane County CASA organization, which is supported by Exchange. "CASA is invaluable. They are the eyes and ears of the court," she said. CASA volunteers advocate for children whose families find themselves in the judicial system. Many judges shy away from abuse and neglect cases, but Clancy Boles sees them as an opportunity. "Abuse and Neglect is a courtroom of hope. But for that involvement, these kids would not have a chance." The "Success by Six" program is entering its second year in Batavia School District 101. 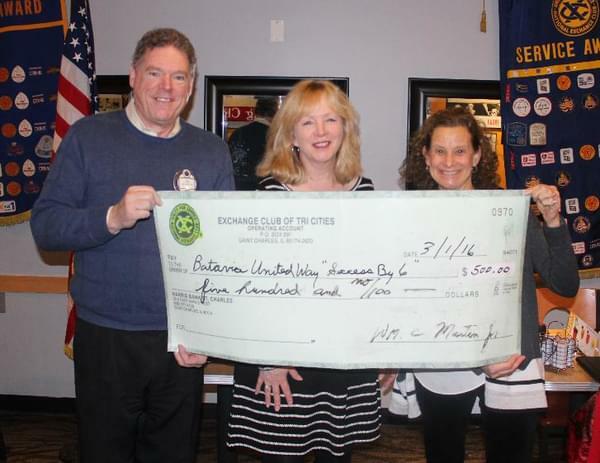 Batavia United Way Executive Director Melinda Kintz said the program provides scholarships that allow lower-income parents to send their children to full-day kindergarten. More than 20 students will participate in year two, up from 15 in the first year. In year one, $20,000 was raised with $14,000 coming from donations and $6,000 contributed by participating parents. The Batavia Park District administers the program, which gives children enhanced learning experiences and frees up their parents for greater employment opportunities. Cecelia Hoffman, a teacher at the Hoover Wood Elementary School, said the children’s progress in the first year of the program was noticeable and very encouraging. 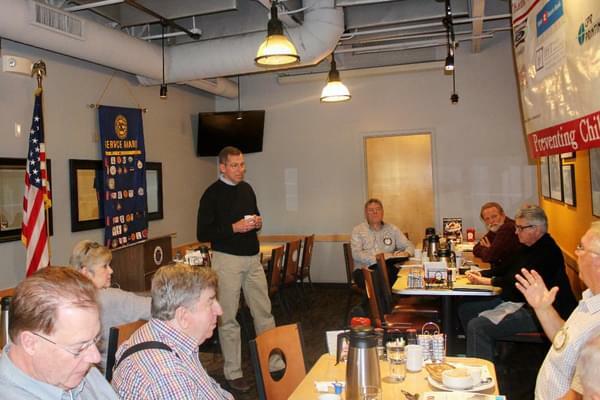 "SCORE is the closest thing to a free lunch you can get in business," said Jim Screeden in his remarks March 29. Jim is one of about 75 retired executives in the area who volunteer to share their expertise with small business startups. Nationwide, SCORE has 12,500 volunteers who counsel small businesses, at no cost. Planning and funding are the two areas where startups usually fall short, Screeden said—failure to plan well enough to really understand how much money it will take to launch. It usually takes 12-18 months to get a small business up and running. Many good ideas fail because the enterprise cannot last long enough to generate the necessary cash flow. • Colonial Café donated 15 percent from the checks of supporters on Wed., Feb. 17, to benefit long-time server Peggy Fodge, who is undergoing cancer treatments. Colonial and other contributors to her GoFundMe page have raised several thousand dollars to help the family cover her medical expenses. • Volunteers are needed to man the booth at the St. Charles Chamber Expo on Saturday, April 16, from 10 a.m. to 4 p.m., at the Sportsplex on Dean Street. See Rich Rohlfing for more information. • The ACE Awards breakfast is set for May 3 at Riverside Receptions in Geneva. The program recognizes students who have overcome major life challenges to graduate from high school. • Fox Valley Christian Action’s annual golf outing fundraiser is set for May 23 at the Elgin Country Club. Tri-Cities Exchange is supporting the event with a four-some. The $250 per player entrance fee includes a box lunch, reception and awards dinner. For more information, visit www.fvchristianaction.org/events/. • Tickets are now available for the annual Exchange Drawdown Banquet, set for May 24 at Royal Hawk Country Club in St. Charles. See Larry Ward to get your tickets and support the biggest fundraiser of the year. 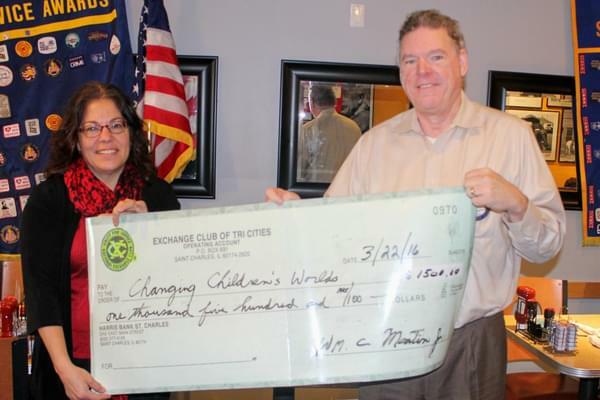 • Tri-Cities Exchange was the fortunate recipient of a $2,300 donation from a new organization, 100 Women Who Care. Every quarter, members of the group donate $100 each and vote to award it to a deserving charity in the area. Thanks to Debbie Carr for making such a good case for Exchange. Part of the proceeds will be used to increase the scholarship money for ACE Award recipients. Lori Linkhamer, a group founder, presented the club with a check. • The Changing Children’s Worlds Foundation spring fundraiser is set for 5:30-8:30 p.m. Friday, April 29, at the Geneva Golf Club. The event will feature the Green Room Improv Group’s standup comedy, and music by Rick Temple of the Chi-Town Showstoppers. There will also be a silent auction. Registration is $75; at the door, $85. For more information, visit www.changingchildrensworlds.org.